We are Gold Coast SEO experts servicing locals and beyond. Our approach uses our 20+ years of web development to your advantage. High value SEO services is our specialty - when you work directly with a skilled developer your site responds much more swiftly without a bloated price tag. Nobody likes a slow website. We consistently achieve successful results for long-term clients who pay only $200 per month and stay at the top of searches on competitive keywords. Other clients prefer to invest more because it is worth it. There are a few of our seo and user interface design ideas below so see if you agree with our concepts. Check our article on SEO vs Adwords for info on the difference between SEO and Adwords. Adwords is a bidding mechanism where the price you pay for a click varies depending on competition. Backlinks are simply inbound links into your website from other sites. Links are the "bread and butter" of SEO. Not all links are equal. A link from a quality site with a good reputation on a specific topic is worth far more than a spammy link on a forum. Google Analytics describe bounce rate as "Bounce Rate is the percentage of single-page visits (i.e. visits in which the person left your site from the entrance page)." Sometimes this information is not available for example some stats packages will give you a visitor duration figure that can be a form of bounce rate. Hence in the above stats 43.5% of visitors left within 30 seconds. These figures are always relative and numbers should vary depending on the type of site. For example if a site is getting a broad set of hits on keywords the bounce rate will be higher - but you are still getting more visitors with good SEO. Firefox, Internet Explorer, Safari and other browsers are used to display web pages on computers and smart devices. A User Interface Design concept chunking relates to breaking information up into bite size chunks so it can be read easily - much like a newspaper. Arthur Miller asserted that humans can absob +-5 peices of information, chunking allows information to be placed in digestible batches. The proportion of visitors to a web page who follow a hypertext link to a particular site. Conversion rate is the rate of sales or effective contacts per visitor. Hence a well designed site may convert 1 in 20 visitors and a poor or more diverse site may convert 1 in 200 visitors. Based on the width of the device, your ideal meta description tag can be between 160 and 320 characters long (920 -1,840 pixels). These descriptions can really help garner clicks. Adwords experts are very good a writing enticing descriptions to get you to click on a paid ad. SEO's also pay attention to this section. However depending on the query Google may adapt snippets of the page instead of running the actual description you enter in this meta tag in the header of a page. The Facebook OG:Description tag allows for 300 characters. So designing blogs with a 300 character limit makes sense. Domain names eg www.GoldCoastLogin.com.au are essentially server addresses that point to where your website is located. .com.au domains have specific rules goverened in Australia. Managing your domain name and its renewal is very important. The domain name should always be in the business entities name (not your web developers). Currently there appears to be little reason to have numerous domain name unless you wish to not allow those names to be available to others. HTML is the code that sits on the server and when opened in a Browser displays the page online. Almost every page's HTML can be viewed on your browser i.e. you can actually view the code written by the developer. Keywords are the words you target in Google for your site. Hence if I wanted to come up highly in Google on SEO Gold Coast - those words would be called my Keywords. A link or hyperlink is how one page comes up when something is clicked on another page. They are coded into the site. Links are a valuable commodity for advancing a site in Google. Learning how to create quality links pointing to your site is a very important SEO factor. What constitutes a local search is very important to SEOs because being recognised as a local company can give you 2 entries on the first page in a search. Metadata is simply data about data. In the Head section of a website are some important SEO tags and general tags. Metadata or Meta tags contain all sorts of information useful to search engine robots and even tags used to help display your content in social media well. For example a tag can be used to tell Facebook which image to use for this page. Given that social media sites are different image size preferences this information is useful to having your page shared. A link or hyperlink that does not pass on PageRank value and indicates to search robots not to follow that link as they crawl the web. These are used in Facebook and Twitter automatically for links. Part of the reason for this is that if these links on popular social media sites did add SEO value it would be chaos with spammers constantly creating fake accounts in an attempt to add value to the sites they link to. Social media can be used for SEO value but not by adding spammy links to fake posts on non poular sites. rel="nofollow" is added to a link. Organic Search refers to a search result that is not paid for via a system like Adwords. The result is there because Google considers the page to be popular. The art of a good SEO is to get your site ranking on keywords. We use a number of tools for this, plus a lot of observation. For example if we notice a keyword starting to do well, that makes a good candidate for more concentrated efforts. The more search traffic a keyword attracts the more competition you will face. Not so long ago there was a mad rush for everyone to get mobile versions of their websites. 'Enterprising' companies were ringing people up and perplexing them with reasons as to why this was so important. It is important to have a site that adjusts to the device it is being displayed on seemlessly. The best technique is to use advanced coding techniques that adjust the display to the screen size. Responsive images are also important - these adjust to the width of the screen. Check our artilce on responsive website vs a mobile version. Google uses advanced techniques via its web master tools suite that can analyse how your site performs as a mobile version. 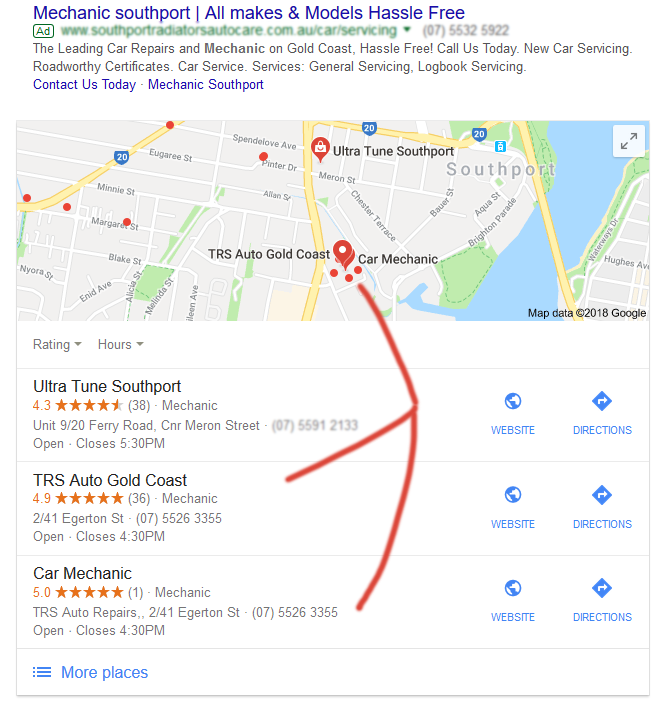 Google My Business Listing for Mechanic Southport - Note the stars indicate Reviews. An article on Anatomy of a Local Search - compares search results on a local search term. Understanding how your site can benefit from a local listing via Google My Business. One mechanism within Google My Business is reviews. A server is a computer often running a Linux operating system primarily used to display web pages. They are pretty much the same as a normal computer but are configured to server up web pages over the Internet. Spam in SEO terms is referring to a spammy site or a spammy link. Google engineers spend vast amounts of time creating algorithms to weed out spam and spammy sites. An example of a spammy link would be a page on a forum where a person adds an entry purely to contain a link to their site in the hope of improving results in organic searches. Another example of a spammy site is one made from copied images and cut and paste text - Google is all over sites like this and they are going nowhere fast. Site speed is increasingly important for higher rankings. 2. It naturally ranks sites higher because the user experience is better. Beware of open source sites created by inexperienced developers Many open source systems are penalised (in my opinion) because each page loads many plugins. These plugins come with libraries of scripts that are used for extra "cool" functionality. For example you may have a slide show on the home page - why then load scripts that run that on other pages like About Us? Unfortunately there is a big difference in size between a custom javasript and one that is used for many functions. In many cases I see sites that are reloading these scripts on every page including pages that are not even using that functionality. Hence you can see sites that look great but run very slowly and do not do as well as a truly custom optimised site. This also allows web developers to look like they can create effective sites - but in fact are creating ineffective bloated slow sites from a template - and unfortunately many of these go on to claim to be expert SEO's. Check your site speed - Note you can check from various global locations and check the size of the page plus a few other useful insights. If your site does not do well on this score talk to us for a detailed explanation. Google has a very useful tool to analyse site speed. Check our article Website speed claims put to the test - often sites claiming to be properly optimised are still loading scripts that aren't even needed on the page. SSL is short for Secure Socket Layer, and it's a standard type of data encryption technology. Google announced is was factoring SSL into its search ranking algorithm. However initially it was difficult to see any real improvement when a site swithed from http to https. It is slightly more pronounced now. There were some pretty wild claims about the need for SSL on a website with no actual need for it. Some unscrupulous developers saw it as a way of gaining extra revenue. If you use your credit card over the internet the site must have SSL encryption to be safe. Originally the only statitics available for a website were crude counters and products like Awstats that analysed web logs. Now there are also products like Google Analytics and Search Console that measure Google search clicks and impressions (when your site comes up in a search). Logs are useful and start with the IP address of the visitor and then list other information that stats packages like Awstats break up and present in graphs etc. A good SEO will use this information to look for success or new keyword opportunities. These logs can also be useful for eliminating hacking attempts because if for example an IP address is constantly going to a specific page trying to hack it you can then block that IP address (just make sure it is not a Google crawler). Good SEO often translates to a knowledge of the server - there is never too much information. An efficient high quality web server will improve a sites speed and reduce spam attacks and up-time. Creating clean code is a very important factor hence having a site validated by W3C is regarded highly by Google - this naturally increases Site Speed. Validation means that the site follows standards - hence when a new device is created even devices we have not thought of yet having valid code means the device will display your code properly if it is compliant with standards. How can you tell if your site is valid and has clean code? You can look at the code by right-clicking and choosing view source and you can copy and paste that code into the validator to see if the code validates to standards. I have kept this glossary simple to cover terms that are most often used and beneficial for a clients to get a quick understanding of the SEO jargon. Part of my SEO techniques is to teach my clients as much as possible to help them self promote their sites.